As you're adding dorm room decor dorm essentials to your college dorm checklist, remember to add college wall decor! You may not think at first how much some simple dorm wall art pieces can add to your college room decor. Your dorm necessities that you go dorm room shopping for are all about making your college dorm room comfortable. You're going to be making your dorm bed feel as comfortable as your bed at home with some super comfortable dorm bedding and you're going to be transforming every other area in your college dorm room to feel more like home. When you're transforming areas like your dorm bed and dorm floor, remember that your college wall decor is just as important to making your college dorm room feel comfortable. Without some great wall decorations for dorms, your college dorm room may feel a little empty. Plus those dorm room walls will be a reminder that you aren't at home and they'll even detract from your overall dorm room decor a little bit. Adding cool posters for dorm rooms like our Secrets of the Mariachi Dorm Poster will add tons of style to your dorm room decorations. This college poster is different from other dorm wall art items and will make your college dorm room unique. 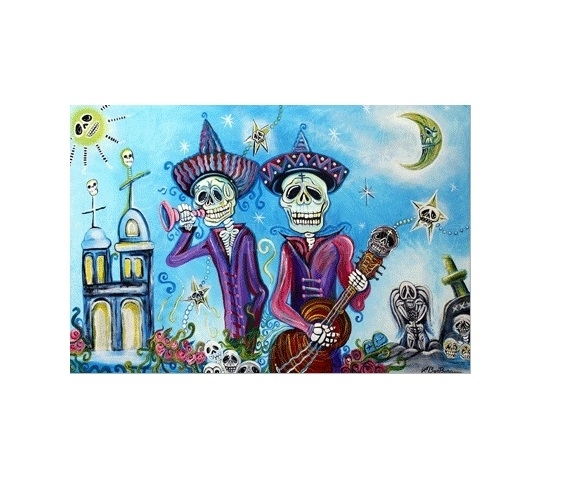 The artwork in this college supplies item features a skeleton mariachi band with a pretty blue sky behind them to add some fun color and flair to your dorm room decor!